Last night was busy. About 200 of my friends have a private party every year and that was last night. 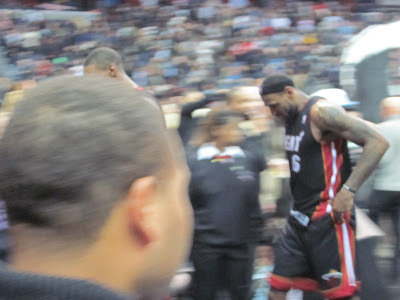 In addition, the Miami Heat were in town to take on the Washington Wizards. Earlier in the day, the Wizards and the Orlando Magic executed a trade that sent Gilbert Arenas to the Magic (i.e. in exchange for Rashard Lewis). There was also talk before the trade was "announced" that President Obama would be at the game. Needless to say, and maybe it was coincidental, after the trade was announced word spread that the President bailed and skipped the game. **** I think I read that he had a scheduling conflict. I arrived at the Verizon Center late, because I had to get ready and bring a dress with me for the party I'd be heading to after the game. By the time I got to the arena, I missed the player introductions and the opening tip. **** I hate when I miss the opening tip of a game. I checked the score board and the Wizards were winning. Specifically, I remember Nick Young was ballin'. It's definitely Nick's turn to shine, now that Gilbert Arenas is gone. 2 rows in front of me was the Miami Heat bench. Yep. 2 rows. If you don't like it, TOUGH. I get what I want. I till can't get used to seeing Zydrunas in a Heat uniform, but it is what it is. 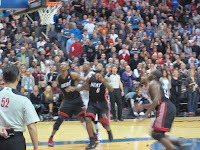 As I watched the game unfold, I couldn't believe what I was watching. 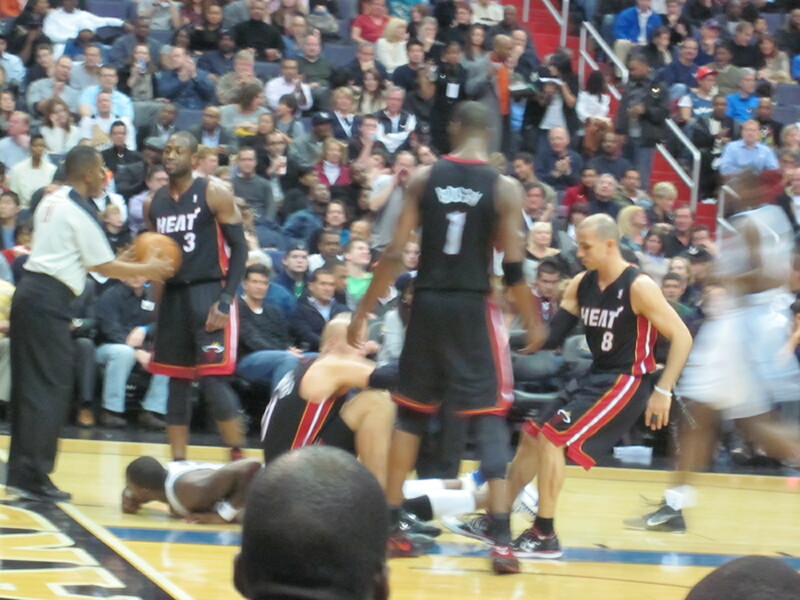 The Wizards had the lead, and the Heat looked tired (i.e. they were in New York the night before). 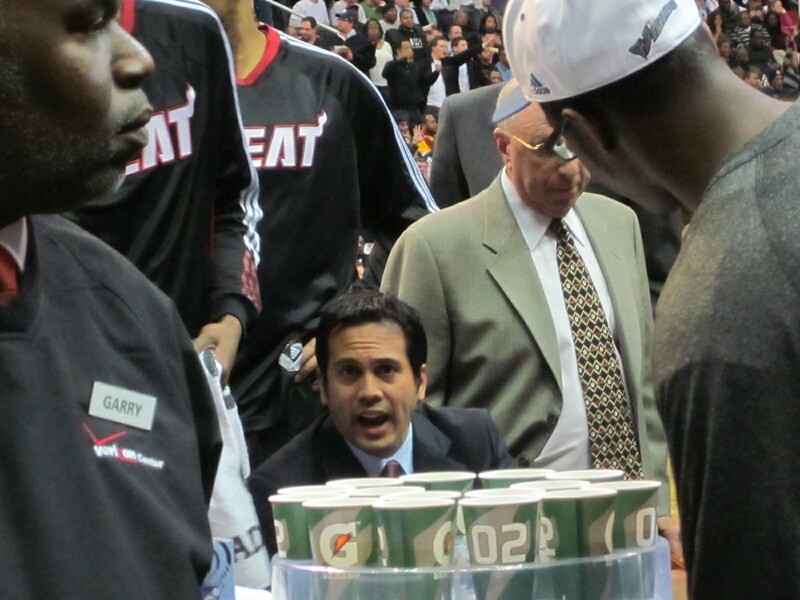 I noticed Coach Spoelstra in front of me. He's so cute! He's had my eye since he was on the other end of the Heat bench. I wish him the best. Too bad that his team has to win in order for him to be successful though. I'm not a fan of the "Unholy Union" created by LeBron James, Dwyane Wade, and that other guy. I do like Wade though. As an Ohio girl who's spent many years in Northeast Ohio, I just can't get down with and support LeBron after the way he executed his "Decision". 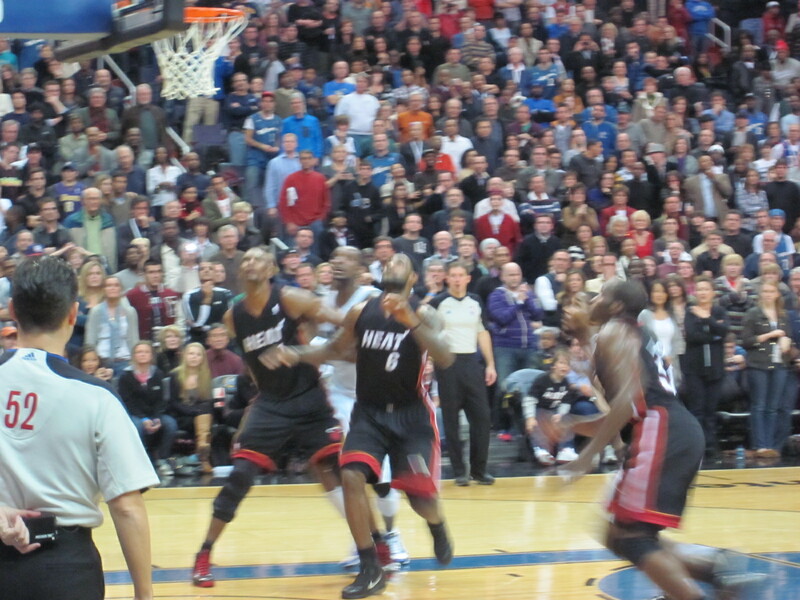 During the game, a guy a few rows behind me yelled, "Hey, Dwyane Wade. You're so good, you don't even have to PLAY defense." It was quiet. 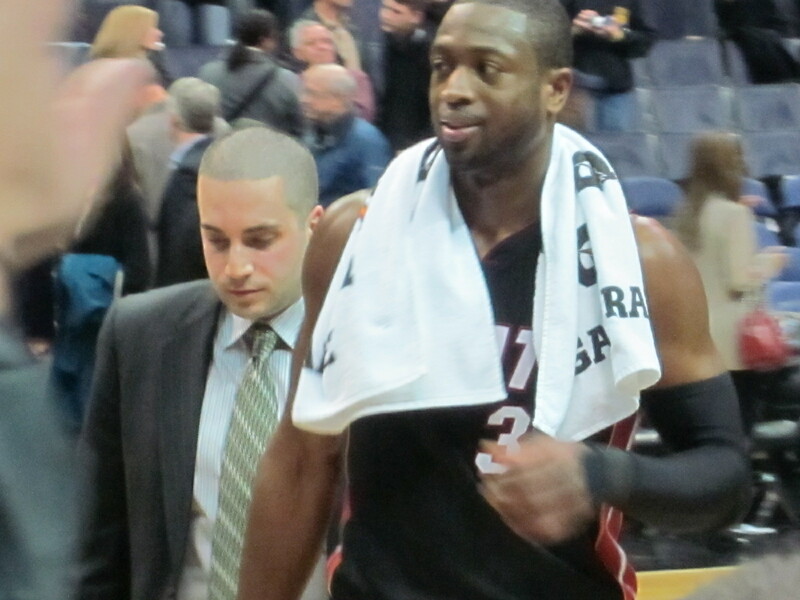 Wade heard him and laughed. The entire section laughed. It was an AWESOME MOMENT. 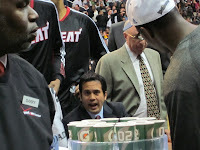 As time ticked away in the Coach Spoelstra could've easily conceded the game and let his players rest. Instead, the Heat fought back. They hustled. 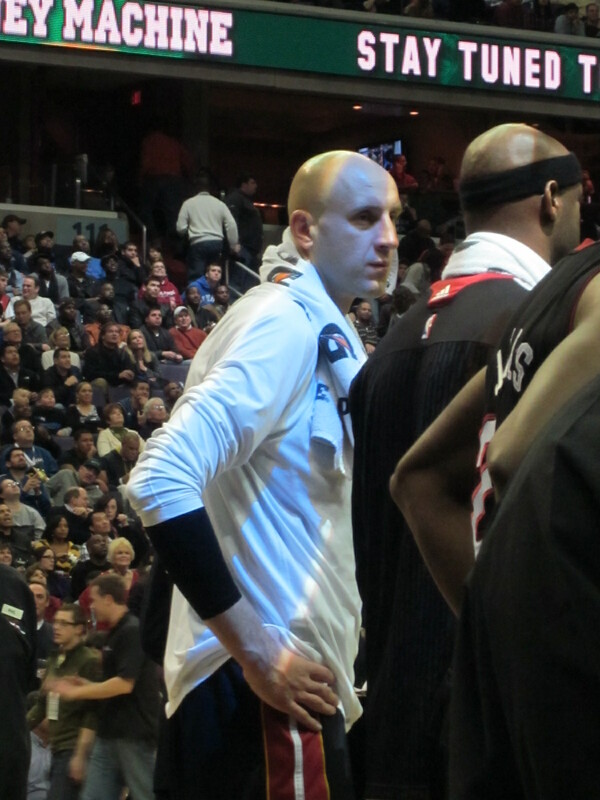 The often injured Zydrunas Ilgauskas even hit the deck fighting for a rebound. 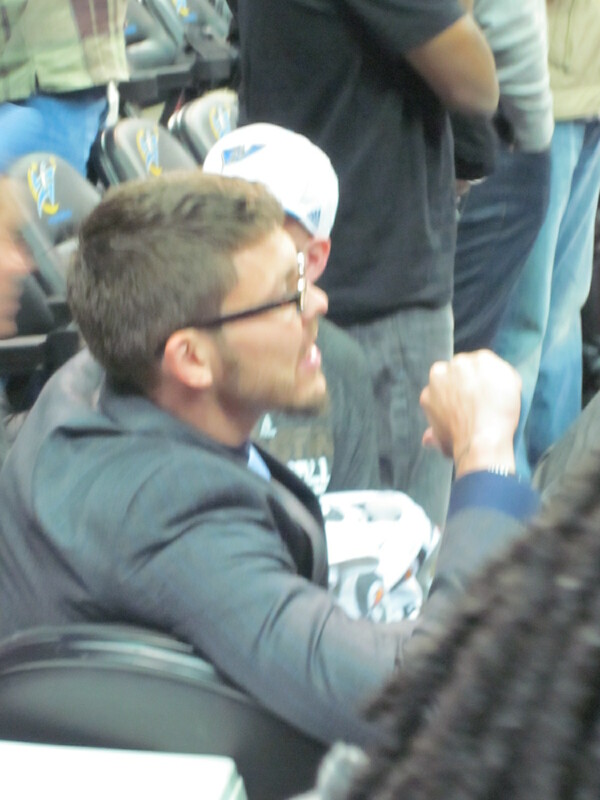 With about a minute left on the game clock, my friend in section 121 started jawing with Mike Miller. He told Miller to warm up the buses, because it was time for the Heat to go home. Mike just smiled. Who knew Miller would have the last laugh?!?! **** Miller must be salivating at the chance to hit the court with the Unholy Union... I need to see when he's returning from his injury. As time elapsed the Heat edged back into the game and during the time outs, Miller was laughing and smiling. I asked my other friend near the section, how he thought the game would end. He gave me a "thumbs down" signal. Everyone knew the inevitable was going to happen. The stress was palpable. 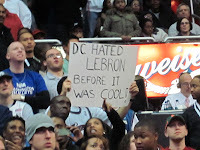 The Washington Wizards couldn't close the Miami Heat out, and they were going to pay for that mistake. One of the Heat bench players looked at my section and said, "It's over now." He was right. The Heat defeated the Wizards and won the game with a final score of 95-94. For the Wizards, Nick Young had the game of his life with 30 points. LeBron James led all scorers with 32 points. For those of you that don't know. Washington DC isn't generally fond of LeBron because of all the Wizards v Cavs playoffs series, back when the Wizards were competitive. LeBron had the last laugh last night.